One month after starting our worm bin project, three quarters of the bin floor was covered with food scraps. 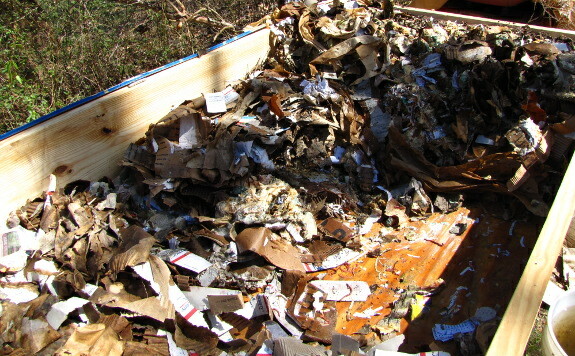 I figured it was time to push the decomposing scraps and bedding toward one end of the bin so that I would have room to put in the next batch of food. This also gave me a great opportunity to see what was and wasn't working in the main decomposition zone. The good news is that there are worms everywhere. Our redworms seem to be reproducing very quickly since every bit of the bedding is colonized with a healthy population of worms. The easy to decompose waste --- spinach leaves, for example --- had already been converted into worm castings, but a few areas where great globs of mashed potatoes hadn't mixed into the bedding were moldy and not appropriate for worm action yet. I'll have to remember to layer the food waste a little less thickly and include more bedding with similarly gloppy waste in the future. 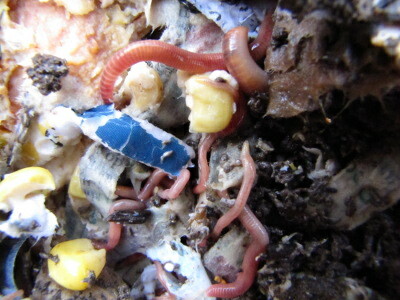 I was also pleased to see that the worm bin was already turning into a healthy ecosystem. When I got started with worms, I assumed that worms did all of the decomposing in the bin, but the truth is that you'll find insects of all sizes working alongside your livestock. Many of the wild critters are good news, starting the decomposition process so that worms can do their job faster --- I suspect that this picnic beetle (probably attracted to a high density of pickles) falls into that category. On the other hand, the few house flies I saw in the bin are warning lights, telling me that I need to top off the food with a bit more bedding. Total food waste liberated from the landfill to date has been 699 pounds. We've put about a fifth of that in the bin so far, with the amount increasing each week as our worm population grows. Escape the rat race and start to live with our $2 ebook. Great Job! I've become infatuated with your Worm Bin project... Question - where are you getting your food supply? It's hard to belive two folks are producing that much food waste, lol. I'm so glad I'm not the only one infatuated with our worm bin. If you follow the link to "worm bin project" in this post, you'll see the long answer, but the short answer is that we're getting all of the cafeteria food waste from our closest school. They've only got 80 students, though, so imagine how much food you could get from an average-sized school!